If you asked me a few decades ago whether the Jersey-based comedian I’d seen on MTV’s “Half-Hour Comedy Hour”, Jon Stewart, was going to end up being the man who’d bring you the realest fake news you’ll ever find, I probably would’ve given you a sideways glance. These days, it seems not only believable but also desperately important; Stewart has become one of the few reliable sources of stories that mainstream media would often leave untold. In this case, the chilling story of an interviewee from “The Daily Show” attracted Stewart’s attention and inspired him to take his first turn running the show behind the camera. “Rosewater” is based on the novel “Then They Came for Me” (recently re-released under the name “Rosewater”) , the true story of Iranian-born journalist Maziar Bahari (Gael García Bernal), who was in Iran in 2009 at the time Mahmoud Ahmadinejad squared off against Mir-Hossein Mousavi for the Iranian presidency. Bahari returned home to Tehran for a week, to report on the election for Newsweek magazine, but his family’s history of dissidence and subsequent imprisonment made him somewhat gun-shy on photographing even something otherwise so innocuous as a satellite dish array run by opposition-party supporters. When Ahmadinejad declared a landslide victory before the polls even closed on Election Day, Bahari got a sense that something had gone horribly wrong; any optimism he felt upon arrival home was effectively squashed. Worse still, the protests that erupted subsequent to the news of Ahmadinejad’s re-election turned bloody and violent. Chided by his friend and driver, Davood (Dimitri Leonidas), for his failure to use the weapon in his hands – his video camera – Bahari sheepishly began videotaping a fiery protest that attracted gunfire from the Iranian military. He then passed his recording along to the BBC, who transmitted it to London that very night. The next morning, he was escorted to a prison where – much like his father and sister before him – he underwent confinement, interrogation, and systematic attempts to strip away his hope. Bahari was often forced to wear a blindfold, so “Rosewater” refers to his near constant companion, an interrogator who perfumed himself with rosewater (Kim Bodnia). The interrogation sessions, filled with psychological and physical attacks, were aimed at breaking Bahari’s spirit and securing a confession that he was a spy for the West, working undercover as a journalist to help foment revolution and spread lies. One of the pieces of “evidence” used against Bahari was an interview with Jason Jones of “The Daily Show”; whether or not the satire was lost on the Republican Guard, Jones’ humorous attempts to paint Bahari as a spy were used as ammunition during at least one interrogation session. Over the course of 118 days, Bahari was held in captivity, his sanity and salvation constantly just outside of his reach. Ultimately, multiple confessions – including one where Bahari agreed to spy on behalf of Iran – were required to secure his release. All of the actors give incredible performances, and the writing and directing (both Stewart) are top-notch. García Bernal, in particular, is astonishing in his range of feelings and expressions; you experience the roller coaster of emotions along with his Bahari, while watching from the uncomfortable comfort of a cushy theater seat. Lighting and technical overlays highlight the impact the Internet – especially Twitter – has in supporting the flow of information and communication. The importance of freedoms of association and communication can’t be oversold. Bahari’s story is a cautionary tale of false freedom and real imprisonment, and Stewart & co. have brought it to the screen in an Oscar-worthy manner that’s touching, shocking, and altogether mesmerizing. 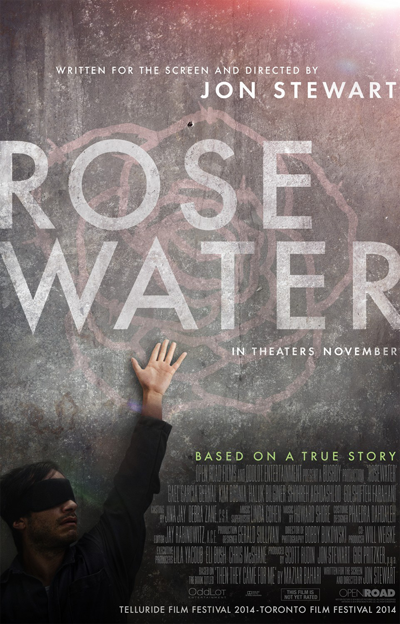 “Rosewater” opens nationwide on November 14, 2014. This movie is rated R for language, including some crude references, and violent content. This entry was posted in movie reviews and tagged jon stewart, Maziar Bahari, movie reviews, rosewater by crunchymetromom. Bookmark the permalink.